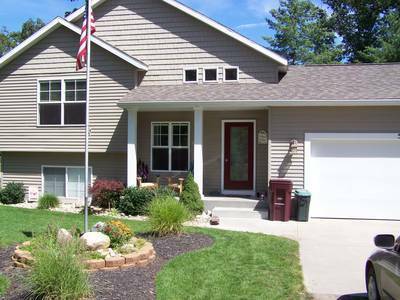 Beautifully maintained contemporary bi-level offering 4 bedrooms and 2 full baths. 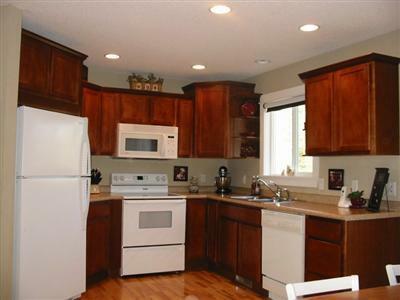 Features cherry cabinets, hickory floors and ceramic tile in the bathrooms. In addition there is a patio and deck for outdoor enjoyment. 2-car attached garage. Large wooded lot. Buyer to verify all information. 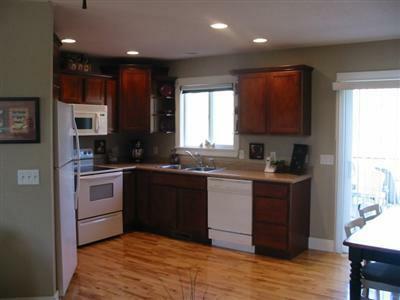 It features central air, large lot, underground irrigation, 2-car attached garage and much more! It includes appliances (gas stove, microwave, refrigerator, dishwasher). Over 1600 total square feet of finished living space. We've just reduced the price by $5,000. We are expecting to have several offers by the middle of next week, but we will consider a land contract offer. A land contract offer must include at least 10% down. Offers with pre-approved conventional financing will be favored. The home features beautiful hardwood floors throughout complemented by beautiful Cherry kitchen cabinets and matching crown molding. Located in a newer subdivison on a dead end street. This home is located on a large corner lot with beautiful landscaping including underground irrigation, large play area for children and a outdoor firepit built into a paver patio. Home also offers 2nd floor deck, walk out basement onto cement patio. It's a great neighborhood for walking, running, biking, hiking in the nearby wooded trails, and raising children. The main floor features hardwood hickory flooring through out the kitchen, dinning and living room as well as in the front entry area. Open floor plan for the kitchen, dining and living room to allow for easy entertaining. Dining room has a slider that opens onto the 2nd story deck overlooking the spacious backyard. double access full bathroom as well as a nice size 2nd bedroom. The second floor features another full bathroom; Living room with door leading to the cement patio, 2 more spacious bedrooms as well as a nice size laundry room that has access to additional storage. The basement living area can be entered separately through the walk out basement door. Best effort has been put forth to ensure that the information here is accurate.